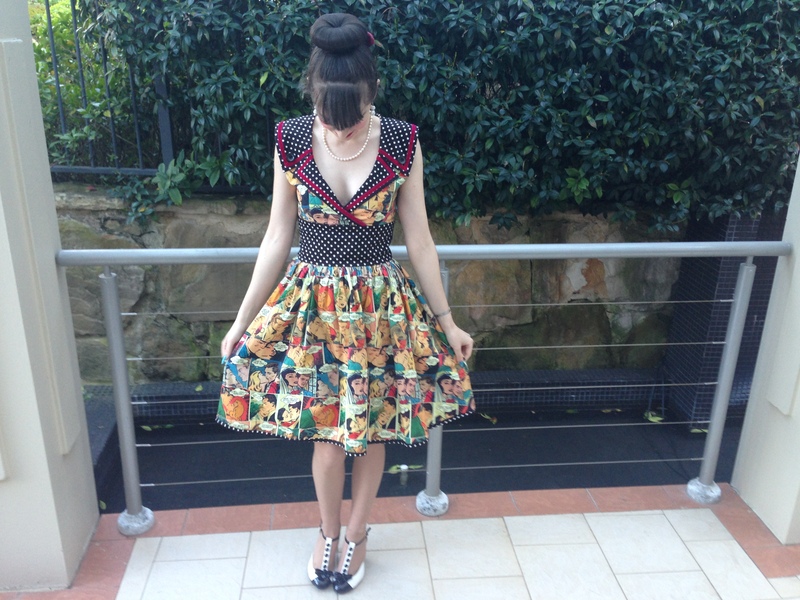 This week I was excited to wear my comic print dress, which I showed you in my last post, for the first time. 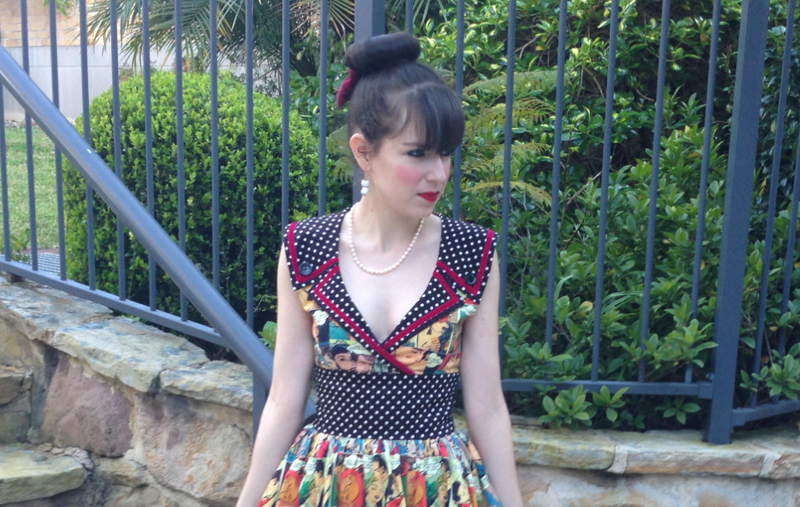 I love everything about this dress; not only is the print unique but I adore the collar, the mix of patterns, the attention to detail (buttons on the collar and polka or velvet ribbon trim) and the cut of the dress. I wish more of my dresses were cut like this; I’d buy it in so many different patterns and will definitely keep an eye for if Kitten D’Amour brings it out in future collections. I wore this to work for an offsite meeting so I definitely feel like I stood out. I even found myself reading the speech bubbles on the comic strips during the day. I didn’t realise how much of a perfect match these shoes would be to the dress. The colour combination of the heels and the little buttons along the t-bar closely mirror the polka dots on the dress. I wish I could wear this outfit almost every single day; it’s definitely one of my favourites. 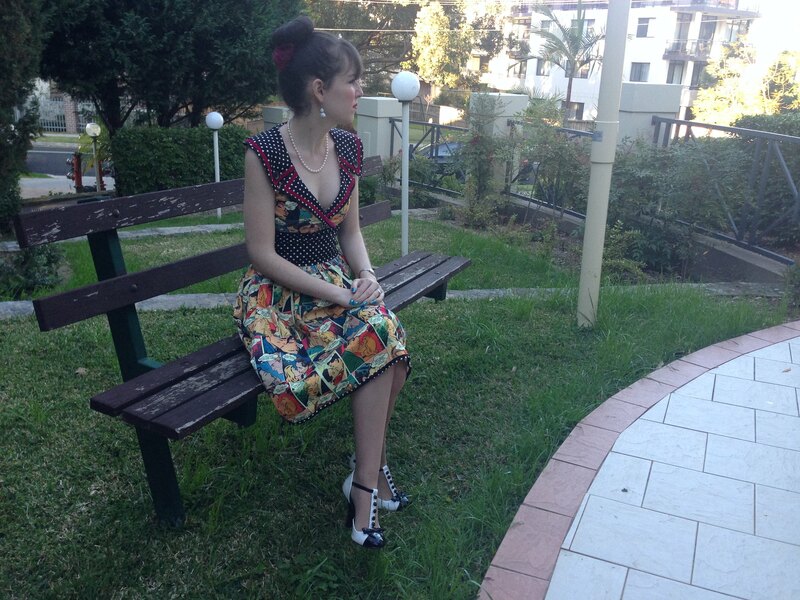 This entry was posted in Kitten D'Amour, Outfits, Uncategorized. Bookmark the permalink. Love that dress, and the shoes perfectly compliment it! This dress is stunning!! I love all the mix of patterns and it fits you so well. BTW, I host a weekly link up on Thursdays and hope you will join me this week. Your dress is just gorgeous – so unique, and you look wonderfully stylish! What a super cute dress,! I love the shoe with it and the pearls, perfect styling! loved that dress the first time you showed it in a haul and i love it even more when you wear it!! so cute! Comic-print dress? You've the most unique collection of clothes, Tia! love your style, such a fun print, and those shoes are great! Such a lovely outfit. 🙂 This reminds me of the 50s or 60s. Have a great week pretty. 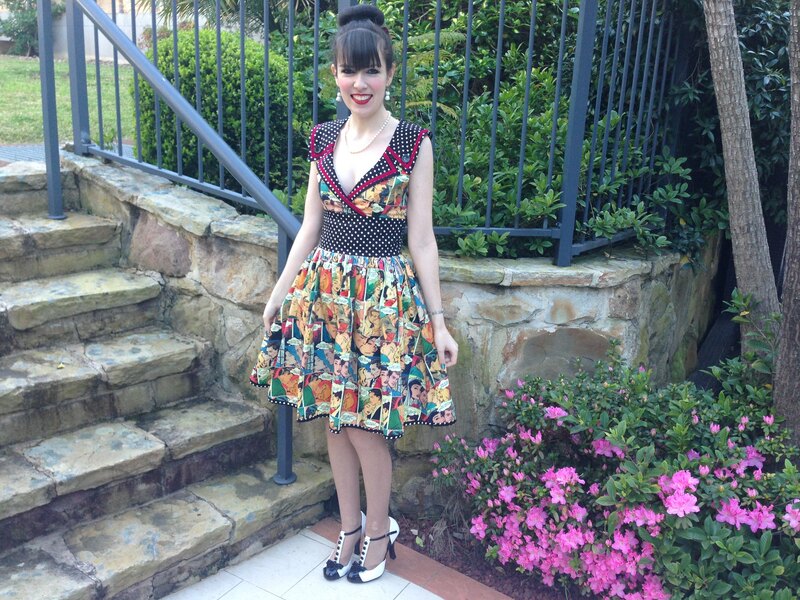 Oh Imogen, the dress looks absolutely beautiful on, the cut is to die for and the retro print is just perfect for you. I still love those monochrome shoes too. 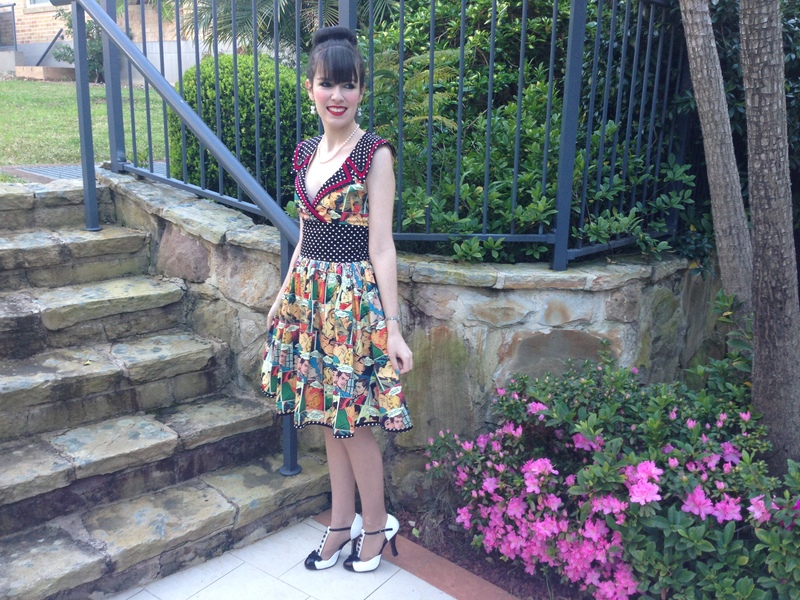 It is such a beautiful dress and works so well with your hair. I am not surprised you would like to wear the same outfit every day! Prettiest dress! Thanks for sharing with Visible Monday, xox. The print of that dress is gorgeous! I love it with the black and white shoes! Your hair looks fabulous girl! I love the bangs on you and you sure know how to rock a red lip! Your comic dress is such a great piece! I like it a lot. 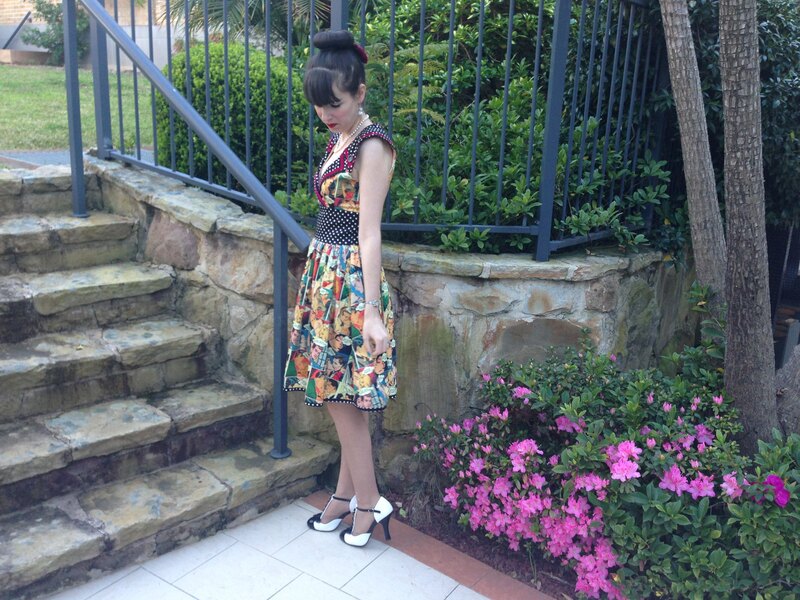 This is such a fun, vibrant and feminine dress! wow the dress looks amazing on you. It is so unique and different. You look great in it. Wow! I love how lovely and unique this dress looks on you! Those shoes pair with it perfectly! What a dress, I love it, so much fun!!!! What a fun dres! It looks great on you! You look fabulous in this dress! I especially love the fun print and interesting collar details. Great shoes too! The cut of this dress looks really great on you! I can see why you'd be so excited to finally wear and share this–it's absolutely darling and fun! May it have many, many more years of wearing. You look way to fabulous! This look is beautiful ! !